I got carried away again. 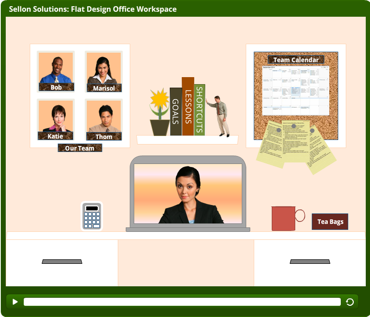 The Articulate eLearning Heroes Challenge (#50) for this week was actually very simple: create an image of a workspace using the very popular (thanks, Apple) flat graphic design style. Easy, right? This is actually not a style I’ve really embraced, so that made it a good reason to take on the challenge. But as Articulate’s Tom Kuhlmann had just released a set of flat graphic assets for free use, I didn’t want to replicate what he had already done. That made it even more of a challenge. Creating some flat graphics was more fun that I expected! For instance, I started making a flat photo frame with four images in it, and when I had it in front of me, I realized that if I put a blue gradient into each of my four rectangles, the picture frame suddenly became a window to the outside world. Granted, I can be easily amused. Eventually, I changed the window to a cork board because I needed the real estate. But it was surprisingly fun playing with simple shapes and assembling them in various ways to create other objects. Even so, graphics for their own sake wasn’t holding my interest long term. So I decided to make it an interactive, exploratory workspace sample, and to give it a specific context. Suddenly, Articulate released the long-awaited Storyline version 2! I opened it up and laughed–the entire interface now boasts a “flat” design! Once I started looking around, I got lost, the way I get lost when I walk into Costco and see all those big, long aisles and all those shelves…. So while I’ve barely scratched the surface of the nifty-looking new features, I did find time to incorporate two motion paths, and a slider. Motion paths were pretty easy to sort out; wrapping my head around the workings of the slider was a learning experience for me. But the end result is quite fun. I also incorporated an elegant calculator, courtesy of eLearning Locker. Creating a mini, flat version took some time, but arranging the little squares became a kind of zen exercise. Anyway, better late than never, here is my submission for the flat graphics challenge. My thought was that something like this could serve as the beginning of a new manager training program. After the manager explores the workspace, then we could present them with a number of different scenario-based challenges, using the team characters and information introduced in the workspace. Branching would make it possible to play out different sets of results from the manager’s choices. I know, I could have stopped with just creating a flat workspace. But once the ideas start percolating…. To launch my new sample, just click on the image in this post. Thanks for another fun challenge, David Anderson! Free Gamification Course on Coursera.com Starts January 26th!